If you're not buying Bristol-Myers because of last year's Opdivo trial failure, you ought to reconsider. 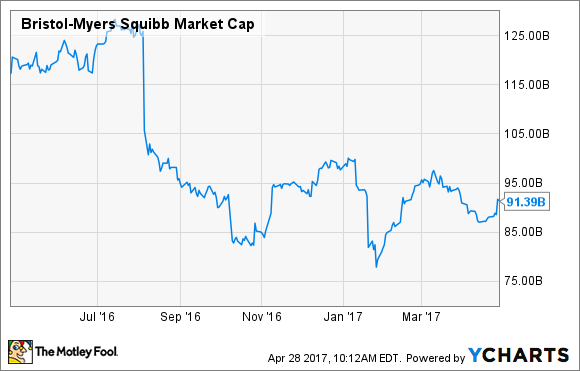 Shares in Bristol-Myers Squibb (NYSE:BMY) tumbled over worry that Opdivo's sales would slow following a failure in a key cancer drug trial last year. However, Bristol-Myers' first-quarter financial results show that demand for Opdivo remains strong despite the setback, and that could make buying Bristol-Myers shares now a smart investment move. Opdivo is a checkpoint inhibitor that stops cancer cells from using the PD-1 protein to evade detection by the immune system. The ability to short-circuit cancer cells' use of PD-1 has proven effective in various patient groups, including in advanced non-small-cell lung cancer (NSCLC) patients who have seen their disease return following chemotherapy. Opdivo's ability to help patients in several indications quickly turned it into a billion-dollar blockbuster drug, generating more than $800 million in sales during the second quarter of 2016 alone. The potential to expand Opdivo's use led many investors to buy Bristol-Myers shares. However, Bristol-Myers reported last August that Opdivo failed to outperform chemotherapy as a front-line option in advanced lung cancer patients, and that cast significant doubt on Opdivo's future. Opdivo's failure in first-line advanced NSCLC was particularly disappointing because competitor Merck & Co. (NYSE:MRK) had reported only a few months prior that a trial of its checkpoint inhibitor Keytruda was effective in this patient group. With Merck set to win approval by the Food and Drug Administration for expanded use in lung cancer patients, and Bristol-Myers' falling short, investors knocked $30 billion in market cap off Bristol-Myers' shares by mid-January. BMY Market Cap data by YCharts. The outlook for Opdivo sales might not be as bleak as feared. Yes, Keytruda has won FDA approval as a first-line option in advanced NSCLC patients, and that does give it an advantage over Opdivo, but Opdivo's first-quarter sales were encouraging, and Keytruda's advantage in NSCLC may be only temporary. In Q1, Opdivo's sales at $1.1 billion were 60% higher than a year ago, and while sales slipped from $1.3 billion in Q4, that was due mostly to a tough comparison following one-time catch-up payments in France and Germany last quarter. In November, Opdivo became the first drug in its class to win FDA approval in head and neck cancer after showing in trials it can improve overall survival. More recently, the FDA approved Opdivo in February for use in patients with previously treated advanced or metastatic urothelial carcinoma. Ongoing trials evaluating Opdivo plus Yervoy in kidney cancer, hepatocellular carcinoma, and small-cell lung cancer are expected in the next 12 months, and favorable outcomes could help drive future sales growth too. Certainly, Opdivo's performance would have been much better if the first-line NSCLC trial had panned out, and management admits that lung cancer market share will be tough to come by in 2017, especially if Keytruda gets approved for use alongside chemotherapy in NSCLC. Nevertheless, Opdivo could start winning back market share in the indication as early as 2018, if things go its way. The company's got a flurry of ongoing lung cancer trials, including studies evaluating Opdivo in combination with Yervoy, Opdivo in combination with chemotherapy, and Opdivo in combination with other novel cancer drugs, such as IDO inhibitors. It's anyone's guess if those trials pan out, but clearly, Bristol-Myers has a lot of shots on goal in the indication that could help it compete with Keytruda in NSCLC in the future. Regardless of whether Opdivo can eventually win an OK in front-line advanced NSCLC, the drug is likely to continue driving Bristol-Myers' top- and bottom-line growth for the foreseeable future. The company has dozens of ongoing trials across various cancers that should provide a steady stream of label-expansion opportunities. Since Bristol-Myers shares remain well off their peak prices, and the company has plenty of opportunities to continue growing Opdivo, I think now is a good time to be a buyer.